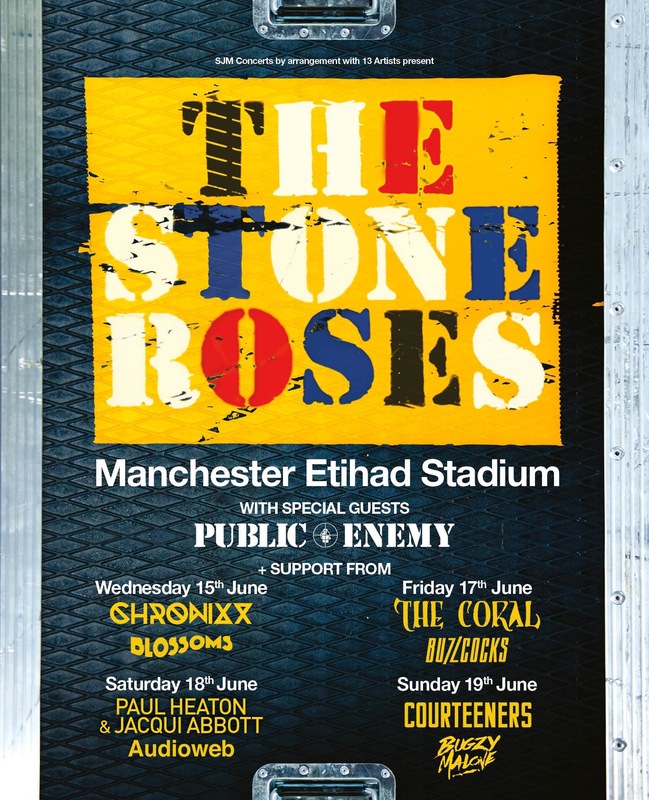 The coming week will see iconic Manchester band THE STONE ROSES play a string of four gigs at the Etihad Stadium. On June 15th, 60,000 people will pour into Manchester to watch the band perform the first of four dates. But what can we expect from these gigs? Kicking off on Wednesday 15th June, with a range of acts supporting over the few days, along with special guests Public Enemy… it’s clear these gigs are going to be insane! The band played two intimate warm up gigs last week in Halifax and Carlisle. Both set-lists included pretty much all the big tunes,including Fools Gold, Love Spreads, and I Wanna Be Adored.. Carlisle were even lucky enough to be treated to Sally Cinnamon, and Mersey Paradise. However, much to my disappointment… two personal favourites – Ten Storey Love Song and What The World Is Waiting For – were missing from both, I’m hoping this changes! Along with the obvious, we mustn’t forget the bands two latest singles, All For One and Beautiful Thing. From what I gathered across social media, All For One initially had mixed reviews, many thought it was ‘average’ from the band; but after 21 years we couldn’t exactly expect another I Am The Resurrection. It’s definitely a catchy tune, and I can’t wait to see the reaction at the Etihad. Beautiful Thing was released on June 10th, and has a running time of 7:02, with many agreeing it’s far more like The Stone Roses we know and love. As for this, or any other newbies being played this week, who knows? There are still a number of tickets left for some of the Etihad gigs, available here. Looks like The Stone Roses are well and truly back!